Let Instant Pot® handle the dinner pressure so you don’t have to!If you have an Instant Pot® and need a one-stop-shop cookbook for quick and easy meals, then look no further. 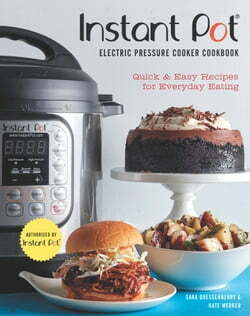 The Instant Pot® Electric Pressure Cooker Cookbook--an authorized Instant Pot® cookbook--will help you feel... read more comfortable using all the convenient features of your Instant Pot®, from cooking fluffy rice and pressure cooking root vegetables, to making homemade yogurt and slow cooking meats, and features more than 75 delicious, family-friendly recipes, including:Spinach and Herb Lasagna; Balsamic Beef Short Ribs; Pulled Pork Sandwiches; Vegetable Green Thai Curry; Spice-Rubbed Cauliflower Steaks; Bone Broth with Fresh Ginger; Crème Brûlée; and Double Chocolate Cheesecake. From healthy breakfasts and sides to scrumptious mains and decadent desserts, these low-maintenance recipes will help you get a meal on the table in a fraction of the time of conventional cooking methods. With easy-to-follow instructions and full-color photos throughout, discover all that your Instant Pot® can achieve with this go-to pressure cooking cookbook.